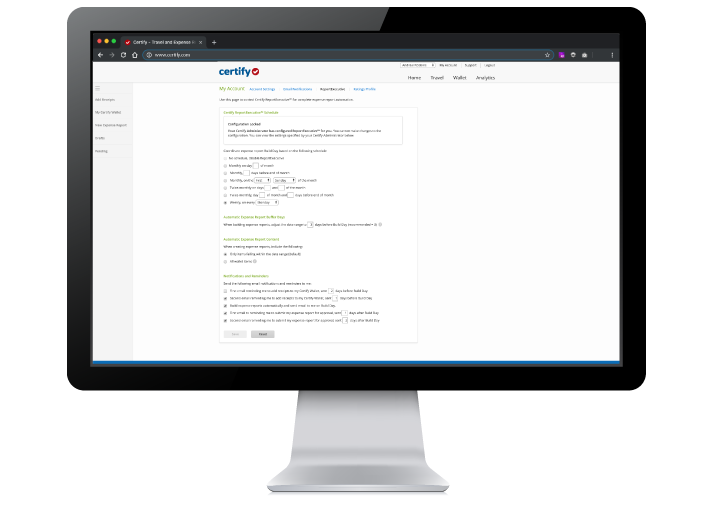 Auto-generated expense reports from Certify can automate travel and expense management reporting for your entire company, and at a schedule that works best for you. No more complicated spreadsheets or paper receipts. No more lengthy approvals or reimbursement processing times. Meet your fully automated expense report solution. Certify ReportExecutive™ fully automates the expense reporting process from end to end, including scheduling, building reports, and friendly email reminders for employees and approving managers. Specify a company-wide schedule to generate automatic expense reports. Users receive a friendly reminder that their reports are ready for review. Employees review reports for accuracy and resolve any policy violations. With one click, expense reports are submitted to your manager for approval. With Certify, administrators can set a company-wide schedule that automatically drives compliance for when expense reports must be completed. When the specified day arrives, all expenses and receipts in each user's Certify Wallet are merged into a new expense report. Each user is then notified by e-mail with instructions to review their open expense reports and submit for approval. Help your business travelers spend less time managing receipts and expenses and more time focused on important tasks. With Certify Mobile, receipt details are instantly captured using our patent-pending OCR technology, and expense fields are automatically populated to save travelers valuable time.